​and assembly that would be required to develop my larger sculpture. My aluminum sculpture is an abstraction of a native central Texas plant, the Antelopehorns Milkweed, scientific name “Asclepias Asperula”. 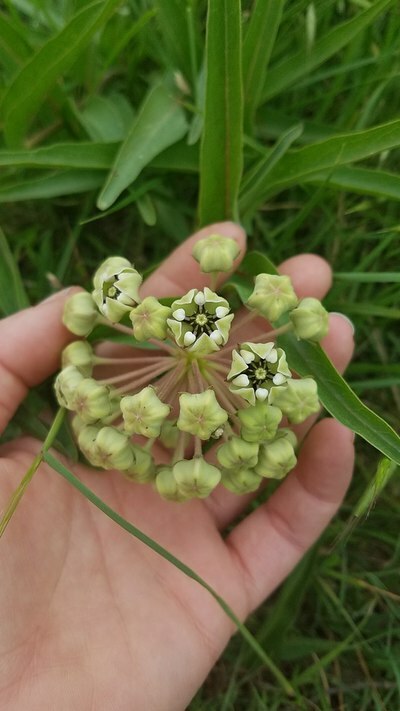 My love affair with the Antelopehorns milkweed started when I was driving home through the fields of prairie land that surrounds my neighborhood and noticed that areas of the field looked as if someone had placed random popcorn balls scattered throughout the field. Curious, I pulled over to investigate. As I approached these popcorn ball-like forms dotting the landscape I realized that they were plants, space-pod Buckminster Fuller looking plants that I had never seen before, clusters of flowers writhing in motion. Crawling out of every corner was some form of life. 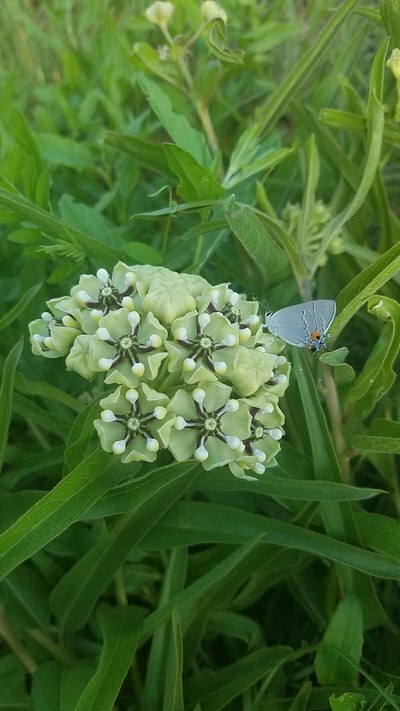 There were small moths and beetles wandering about, flies and bees bouncing from flower to flower, and even a white crab spider ensnaring a bee from behind one of the Milkweed blossoms. From my first encounter, it was obvious that this was a vital food source for a myriad of local species that rely on it. I have never encountered another plant before or since with such a wide spectrum of wildlife dependent upon it. Sadly, that field has since been turned into an apartment complex. The scraping and replacement of native plants within the city of Austin is an ongoing issue we face as more condos and new developments move in on every inch of open land. We can help re-establish native habitats for native plants and insects by incorporating more native plants into our home gardens. 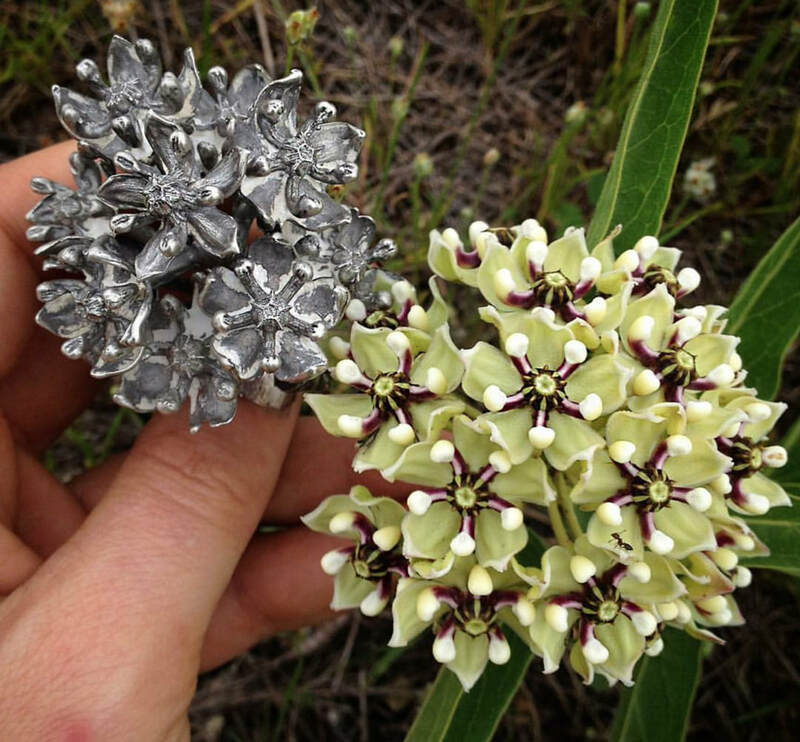 Creating a sculpture for Tempo 2018 is the perfect opportunity for me to help to raise awareness for what I consider one of the most important and beautiful native central Texas plant currently under threat due to expanding development, the Antelopehorns milkweed (Asclepias asperula ssp. coenicup) and hopefully spark curiosity and appreciation for it. 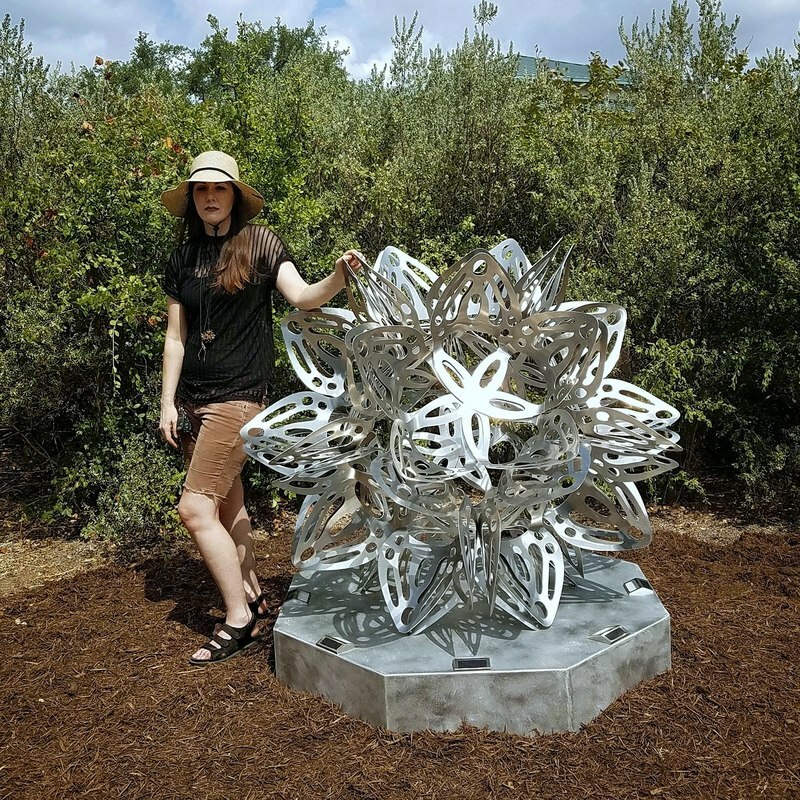 I am interested in engaging the general public in an act of discovery and wonder when they experience my sculpture, much like my first encounter with the Antelopehorns milkweed. I aim to inspire people to learn more about the native plants in central Texas and find ways to include them in their home gardens. I will provide details about how to identify, transplant, and propagate the Antelopehorns Milkweed as well as why it is ecologically important. 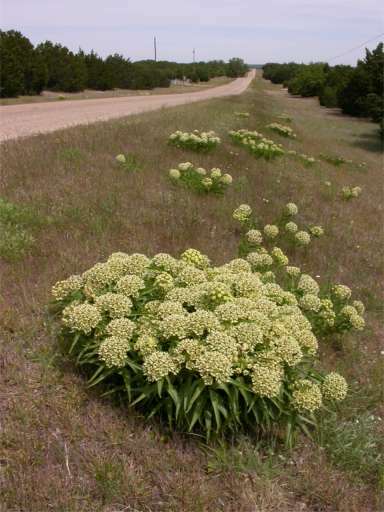 This plant is a hardy perennial and xeric, and although it requires some soil amendments to create it’s preferred well draining caliche soil, it can be easily incorporated into our personal home gardens with little maintenance required. I am hoping to heighten the appreciation of this Antelopehorns milkweed to a point where someday we may see it may be planted as often as Agaves, Yuccas and Prickly Pear Cacti. I gave my sculpture the title 'Asclepius Ecclesia' because it plays on the latin name for the Antelope horns Milkweed (Asclepias Asperula) and my title translates to 'Medicine Church'. 'Asclepius' was the Greek demi-god of medicine and 'Ecclesia' is Latin for church. I believe the appreciation and understanding of our natural surroundings contributes to our ability to understand, appreciate, and respect all forms of life including our fellow humans. Utilizing plants and respecting the living creatures that make up our environments, like our ancestors once did, seems to be continuously diminishing and taken for granted. We can do more to protect our native habitats and attempt to live more harmoniously through responding to apathy with positive actions. Addressing this lack of native plants in our gardens is a starting point. 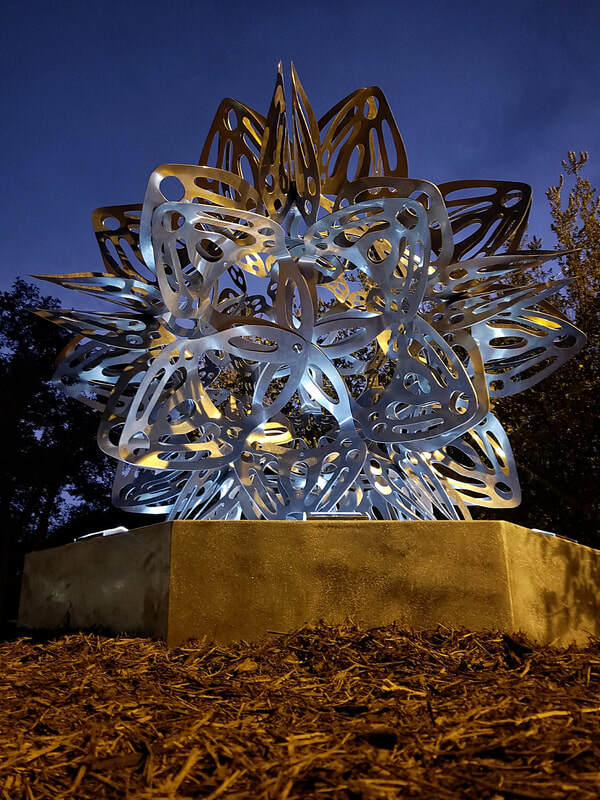 My sculpture incorporates the structure of a platonic solid, the 12 sided dodecahedron believed by Plato to represent sacred geometry and shape of the universe. I chose a dodecahedron because all milkweed blooms contain multiple florets (smaller flowers) that have 5 petals and an interior space which is the shape of a pentagon. I decided to use a mathematically exact polyhedral form to secure structural integrity in my piece. A dodecahedron is a polyhedron that has 12 equilateral sides all of which are pentagons. 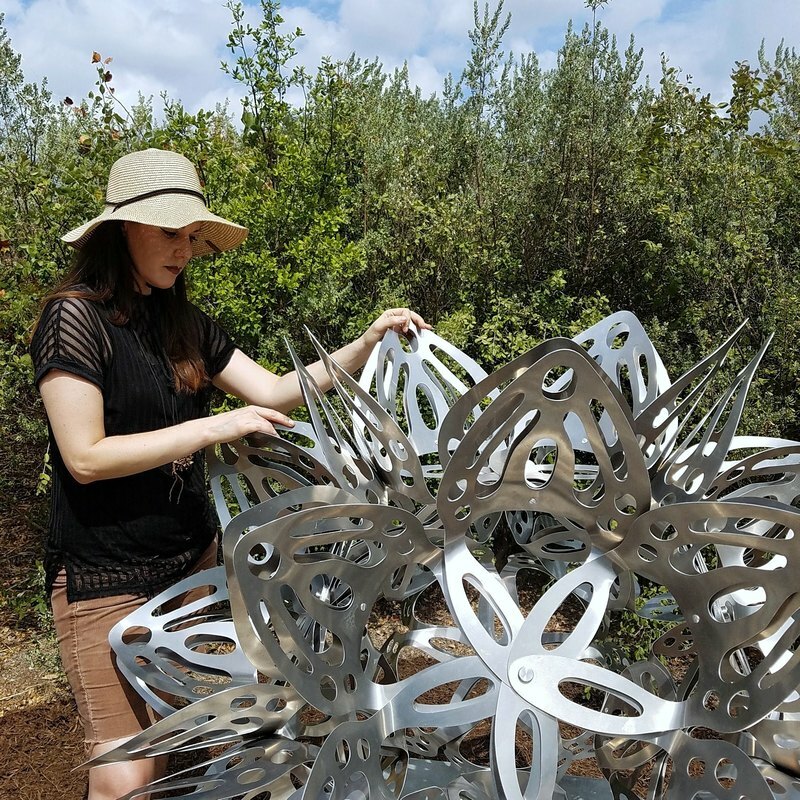 Each side of the dodecahedron has an outward facing Aluminum 5 petaled floret with abstract cutaways within each petal that will filter light much like the cutaways of arches in gothic churches. 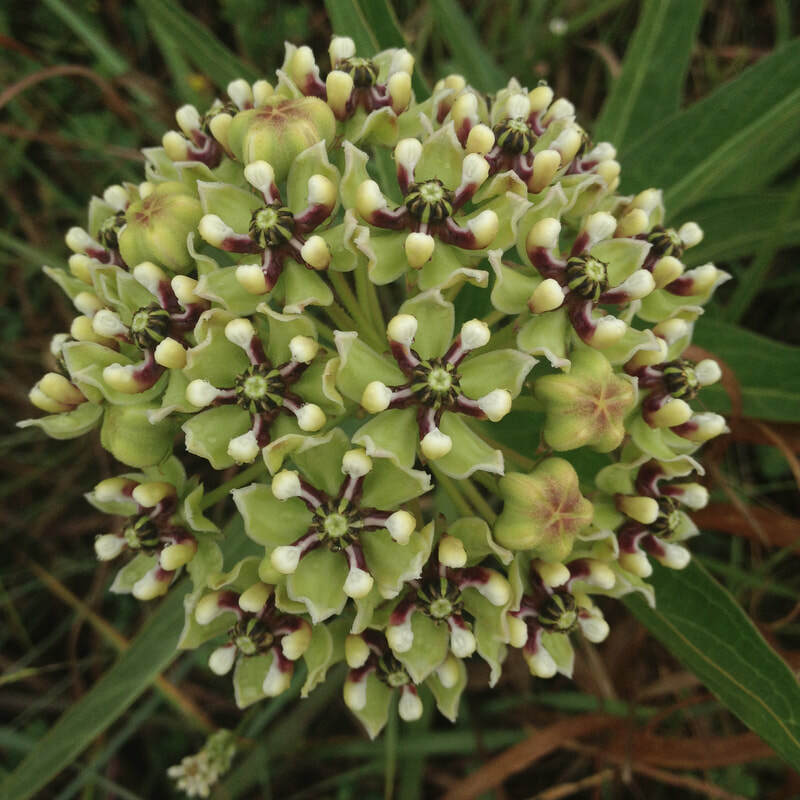 'Asclepius Ecclesia' is approximately 4.5ft wide by 4.5ft tall which makes it approximately twenty times larger than the actual live milkweed bloom. 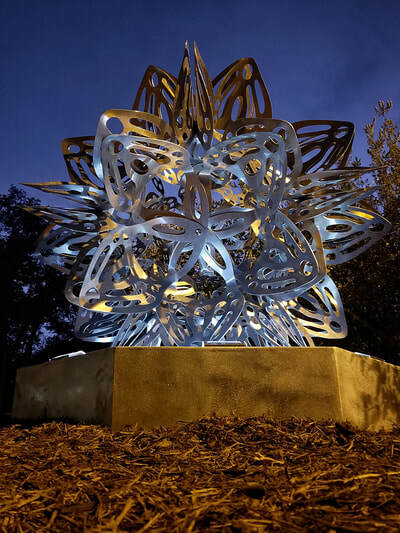 The scale of the piece is intended to draw attention to itself from a distance and invite people to explore it more closely. ​Over the years I have collected many milkweeds from construction sites slated to be turned into parking lots and successfully transplanted them into my yard. 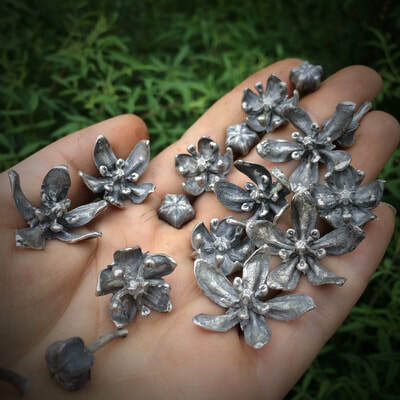 I have also collected flowers and taken molds of them and then cast them in Sterling Silver or Bronze, incorporating them into my sculpture pieces and my jewelry designs. I am a self taught metal worker and jewelry designer. I received a degree in painting. I have always been obsessed with the microcosms around me, through my study and investigations of plant forms, insects and fungi. ​Researching and studying insects and plants that I draw inspiration from and then creating the art objects themselves always results in a deeper form of understanding of the subject matter.I started creating pieces that incorporate herbs and native Texas plants and Arthropods to educate myself in the process, and to educate others or at least spark their curiosity through my work and have an opportunity to tell them about the benefits of the plants both ecologically and medicinally. 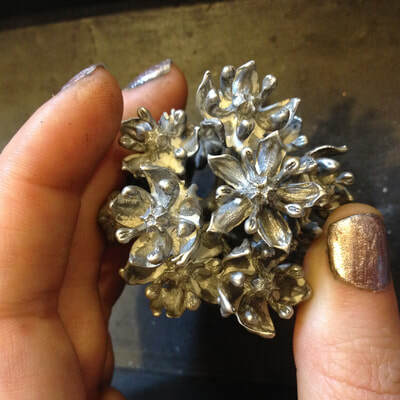 I am passionate about exploring the secrets of nature through my work.I initially began making small art objects in the form of jewelry as a way for me to gain insight about working with metal 10 years ago. 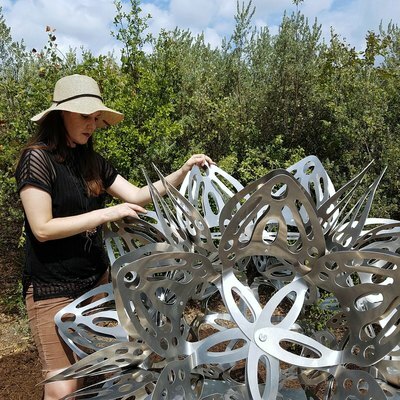 I was making paper sculptures that were essentially plant and insect hybrids at the time and wanted to translate my ideas into metal. Jewelry making seemed like a small and manageable way for me to learn the ropes of realizing this translation through metalwork. I had an unpaid apprenticeship under a woman metalworker for 6 months and then officially started selling my work online in 2009. I continually challenge myself to go back to my initial motivation which was to make metal sculptures that started me on this jewelry making journey in the first place. I have slowly been moving my work more and more towards sculptural one of kind pieces. 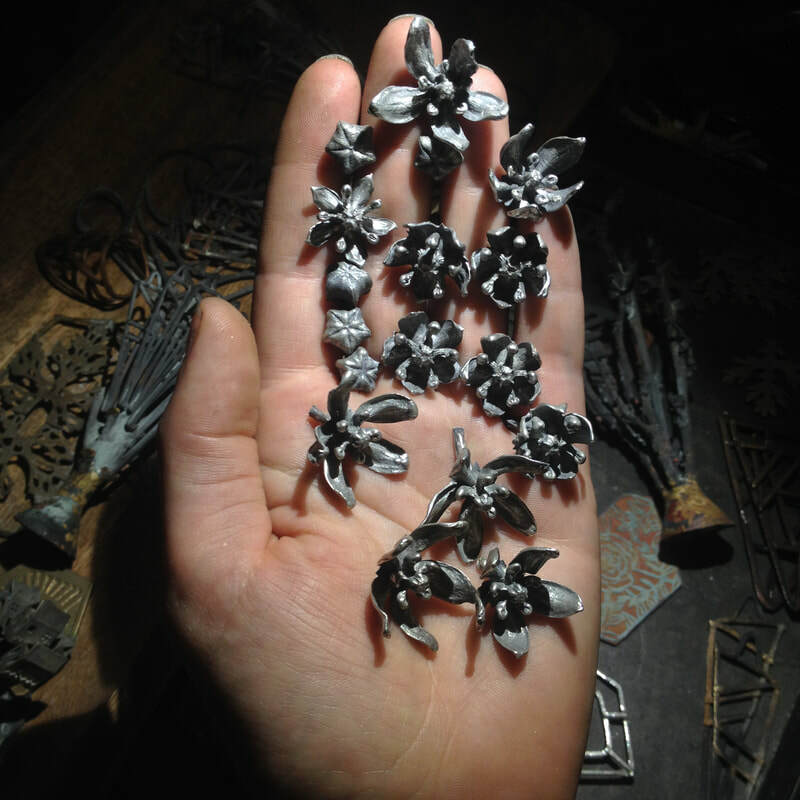 My latest works involve building miniature imagined plant environments and kinetic works inspired by insect anatomy that are both sculptures and wearable art. This can be seen by viewing different sections of my website to see the crossover between what I have been creating as sculpture and jewelry. Once your email address is added to my mailing list, you will always have the option to unsubscribe. All content is copyright protected by Jamie Spinello. © Jamie Spinello / All rights reserved.